Micaela’s love for horses and riding began when she started taking lessons at the age of 7. She continued to ride competitively through high school and college. In the summer of 2015, Micaela completed a college internship at Lovelane with a focus on therapeutic riding. During this time, she fell in love with Lovelane’s horses, staff, students and their families. In 2016 she graduated from Colby-Sawyer College with a degree in Sociology and a minor in Psychology and began working at Lovelane shortly thereafter. Micaela is a MA licensed riding instructor and a PATH International certified therapeutic riding instructor. 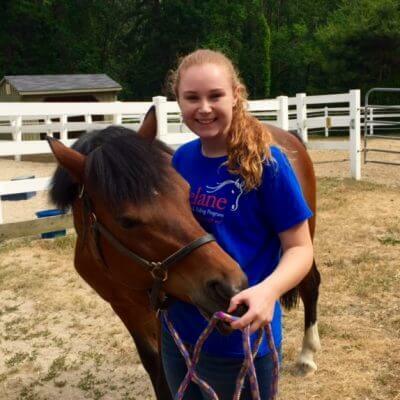 Micaela loves teaching Horsemanship Workshops and our Barn Buddies Program. She enjoys facilitating fun games and watching the students work as a team to keep the barn clean and the horses happy! Micaela finds it rewarding to watch the students progress over time and reach their goals. One of her favorite aspects of her job is watching the relationship develop between horse and rider. Micaela also enjoys seeing the growth of confidence that the students gain from these amazing animals!